This section of my site is not all inclusive yet but I wanted to give you and idea of some of the barbecue island accessories that are available these days and how you can really go to town with the tsunami that is outdoor barbeque cooking. Click on the links on this page and it’ll take your through to the page that will give you more information and up to date prices about each item. At the moment this page is exclusive to readers in North America. If cocktails are more your thing then maybe a beverage center would be worth considering. 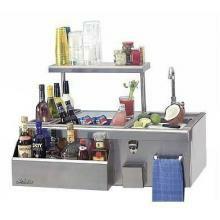 This is either a free standing unit on castors that can hold all you favorite cocktail ingredients or built in as in the picture below, some even come with a blender included! To complete the drinks experience you can also get an ice maker. Just as in an indoor kitchen, many of the ideas are either practical or space saving devices and I’ve listed some of the things available to give you an idea. Sinks -Note the before buying a sink or prep station it is important to work out how you are going to supply fresh water and drain the waste. Most connect either to mains of via a hose and drainage can be mains or to a waste tank. Propane Tank Enclosures - These come in different sizes for different tanks and hide the tank behind an easy access sliding drawer. Cutting Boards - from basic boards through to traditional butchers blocks. Refrigeration Units specially designed for outdoor use. Refrigerators, freezers, drinks dispensers. Whatever the electrical unit is, make sure that it is tested and certified for outdoor use because if you use anything else and it goes wrong, you’ll have no come back on the warranty. The popularity of outdoor cooking continues to grow and even here in the UK it is starting to take shape. That said, the weather in the UK isn't as consistent as we would like to have a fully open air kitchen so we are trying to plan something under cover so that you can be protected from the elements. Once we get our workshop focused on making barbecue islands then this page will get a full update but for the meantime you're just going to have to dream about barbecue island accessories. What Is A Barbecue Island?